Baby Bottle Holder The Bebe Bottle Sling is the only baby bottle holder on the market with its unique suspended design. Other baby bottle holders or hands free baby bottles can't compare to the bottle sling. Have you ever needed an extra hand bottle feeding your baby (or babies if you have twins, triplets, or multiples) but became frustrated propping the baby bottle with pillows or toys that never stayed in position? The Bebe Bottle Sling is designed to hang from any infant car seat handle while holding the baby bottle at the correct position for hands free bottle feeding. Not only will it help the parent, but it's a cute toy that can teach the baby how to hold the baby bottle on their own. Stop using bottle props or proppers that you don't want the infant to play with because you will be constantly re-positioning the baby bottle. Use a baby bottle holder that the baby is encouraged to grab and play with because it helps them develop the hand eye coordination needed to feed themselves while entertaining the baby and helping the parent. 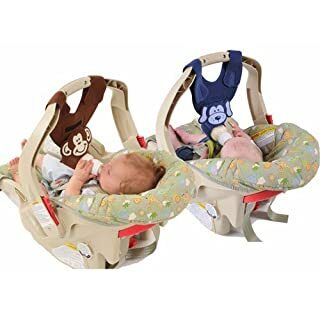 The Bebe Bottle Sling makes an excellent baby shower gift to help moms of multiples get both babies fed at the same time while helping the babies to learn how to hold the bottle. And satisfaction is guaranteed so if the recipient doesn't like them they can be returned for a refund for any reason. 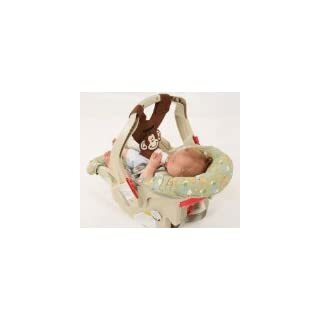 The Bebe Bottle Sling is designed to hang from any infant car seat handle while holding the baby bottle at the correct position for hands free bottle feeding. Not only will it help the parent, but it's a cute toy that can teach the baby how to hold the baby bottle on their own. Stop using bottle props or proppers that you don't want the infant to play with because you will be constantly repositioning the baby bottle. Use a baby bottle holder that the baby is encouraged to grab and play with because it helps them develop the hand eye coordination needed to feed themselves while entertaining the baby and helping the parent. 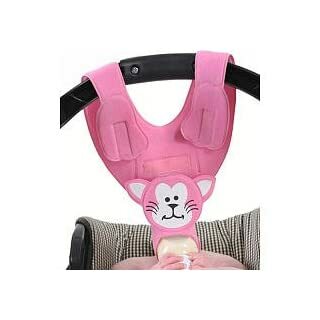 Purchase is for two Bebe Bottle Slings (one brown monkey and one pink kitten style). Car seat and bottle not included. 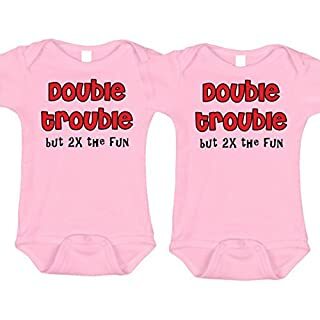 Be sure to check out my other twin and triplet items. 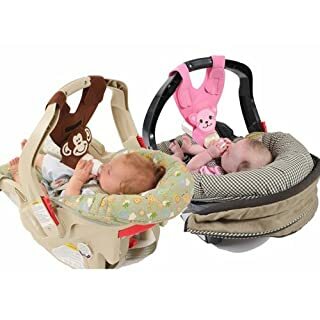 The Bebe Bottle Sling is designed to hang from any infant car seat handle while holding the baby bottle at the correct position for hands free bottle feeding. Not only will it help the parent, but it's a cute toy that can teach the baby how to hold the baby bottle on their own. Stop using bottle props or proppers that you don't want the infant to play with because you will be constantly repositioning the baby bottle. Use a baby bottle holder that the baby is encouraged to grab and play with because it helps them develop the hand eye coordination needed to feed themselves while entertaining the baby and helping the parent. Purchase is for two Bebe Bottle Slings (one navy puppy and one brown monkey style). Car seat and bottle not included. 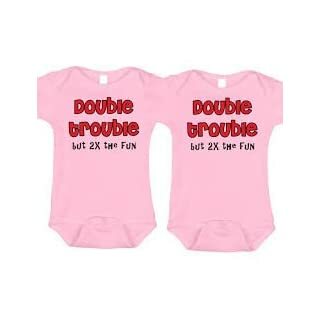 Be sure to check out my other twin and triplet items. If you like this design please check out the many designs we offer for the whole family! Click on our brand name above the title to see our other shirts and shirt sets including onesies and toddler tee designs. Looking for infant gift set that is both fun and practical? 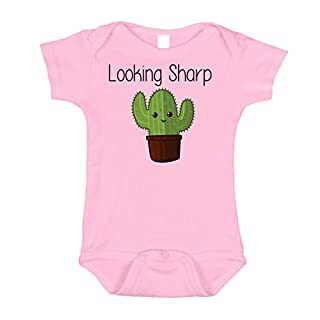 Mom and Dad are sure to go through many infant bodysuits and tshirts during their infant's first weeks and months of life, and you can ensure that they have a cute infant bodysuit or tshirt ready for the little one to wear. Made from the luxurious interlock fabric, our unique bodysuits and tshirts are comfortable for babies and hold up well to washing. Mom and Dad will love how easy it is to get the infant's arms through the lap shoulders, and the snap bottoms mean that they will not have to undress their baby completely to change their diaper! 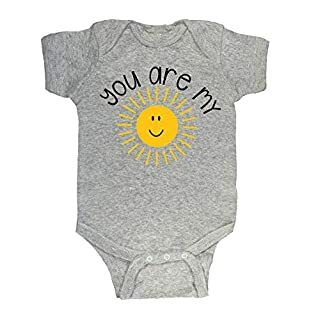 "You Are My Sunshine & Give Peas A Chance" Baby Onesies by BeBe Bottle Sling Please allow 1" tolerance on length and 1/2" tolerance on width. 0-3 Mo (AKA Newborn) : Length 14.5" - Width 7" 3-6 Mo : Length 15.25" - Width 7.5" 6-12 Mo: Length 16" - Width 8.25"